Manchester United appear to be still searching for the right formula to bring the good old days back to the club. But the longer this search goes on, the more they resemble Liverpool from the 90s. The sacking of Jose Mourinho flooded sports news outlets throughout the week. It was almost as if the whole of sport has stopped to make way for it. Of course, it’s big news for ‘the Special One’. He has dazzled the media from the time he returned to the country to resume his love affair with Chelsea. But after the rather acrimonious parting, he seemed to land his dream job when Manchester United came calling. Three years later it’s all over. The board at Old Trafford have had enough. They’ve had enough of the sulking, the petulance, the negativity, and the arguments with players and the media. Mourinho always brings baggage with him, they would’ve known this. They must’ve considered he never builds dynasties, he is always for the here and now. He’s won trophies but there are suggestions his particular brand of management is outdated. To the outsider, it appears the board has much to answer for. Did they not think it could end like this? Mourinho will point to trophies won. But with the club 19 points behind leaders Liverpool, and looking as if a top-four finish will be a real challenge, they pulled the plug before Christmas in the hope they can resurrect things. In his place they have enlisted the help of former striker, Ole Gunnar Solksjaer from Norwegian club Molde. He will be a caretaker until the end of the season when a permanent appointment will be made. One wonders what this means for the January transfer window, and possibly the summer one too. For me, the last five or six years have mirrored much of what happened at Liverpool from the nineties onwards. This article will attempt to demonstrate why. Liverpool won the last of their 18 league titles in 1990. By then it was clear the mystique was losing its shine. Finishing nine points clear of Aston Villa suggests otherwise but the cracks were certainly appearing. The team was ageing and many of the young players at the club needed more experience. Traditionally, Liverpool’s method had been to keep players in the reserves until they were ready for first team football, often leaving them chomping at the bit so they’d hit the ground running by the time they got their chance. But after Kenny Dalglish stepped down during the 1990-91 season, many of these young players were perhaps given too much responsibility too soon. Dalglish had won three titles as a manager. 10 of the previous 15 titles had been theirs, such was their dominance. To replace Dalglish initially the club chose legendary First Team Coach, Ronnie Moran to act as caretaker before appointing another legendary former player, Graeme Souness to take total charge. Liverpool had a tradition of promoting within. Their famous boot room had supported Bill Shankly through his successful period during the late 1950s to 1974. The boot room consisted of Bob Paisley, Joe Fagan, Ronnie Moran, and Roy Evans. All of them went on to manage the club, albeit Moran briefly as caretaker. Liverpool milked the success of the boot room relentlessly, and until 1990 it worked. But football moved on and the club didn’t. The key change in football came with the introduction of the Premier League in 1992-93. With this, there was greater revenue available thanks to the TV deal. Liverpool relied on their name to attract revenue, whereas Manchester United took full advantage. United developed a slick marketing campaign, had a proper focus on sponsorship deals throughout the world. This coincided with success on the pitch as Alex Ferguson dodged the bullet of a sacking in 1990 to finally end a 25-year wait for a title in 1993. United went on to win seven of the first nine Premier League seasons. United were going from strength to strength on the pitch. Off it, they were streets ahead of every other club, particularly Liverpool. Souness’ reign at Anfield lasted just under three years as the club stumbled along desperately believing the glory days were around the corner. So here is where the big similarity between the two clubs’ positions is identified. It took Liverpool, the club and the fans, years to admit they were falling behind. Souness had a huge clear out of the players who had previously won honours with the club. Many of the replacements he brought in just weren’t of the same standard. Coupled with the youngsters brought in needing time to develop, it was a recipe for a club to stagnate, at best. The likes of Robbie Fowler, Steve McManaman, Jamie Redknapp and David James all were given their chance by Souness. All of them still talk of the respect they have for the man. But he shipped out players of the calibre of Peter Beardsley, Steve McMahon, Ray Houghton, Bruce Grobbelaar, Jan Molby and Ronnie Whelan. Souness argued they, along with Ian Rush and John Barnes, were around or over the age of 30 and the team needed refreshing. But Dean Saunders, Paul Stewart, Nigel Clough, and Julian Dicks just weren’t good enough to provide a seamless transition. In 1994 Liverpool decided to go back to the boot room days and appointed Roy Evans as manager. Evans had been a coach at the club for over 20 years. His loyalty was not in question, but perhaps he was just too nice for a new breed of footballer who was now gaining far more power than they’d ever had before. This was the era of ‘the Spice Boys’ tag. It was never publicly stated which characters this label referred to but the likes of Fowler, McManaman, McAteer, Redknapp, James, and Harkness probably weren’t far away with Ruddock causing mayhem behind the scenes. You could argue the behaviour of some United players this season has given rise to a similar label. Mourinho has tried to use his force of personality to demand a change but players such as Pogba, Shaw, Lingard, and Rashford all seem to have suffered from his style. Liverpool’s success had been built on selecting strong, good players and giving them the responsibility for their own career. Training wasn’t particularly complicated as competition for places ensured players were always at the top of their game. Bob Paisley dismantled his hugely successful side of the late 1970s and built a whole new one to continue the success barely a season or two later. Souness had been at the club during this period and must have used Paisley as a blueprint for his own project. But herein lay a fundamental flaw. Fowler, McManaman, and Redknapp all needed more training and support than the club was set up to provide. Off the pitch, there were other errors of judgement which proved fatal. The club had been mainly run on almost a family basis. The board did things behind closed doors and the fanbase generally trusted them to make the right decisions. But they were far too slow to capitalise on a club shop and when the internet opened up opportunities to sell branded goods worldwide they made the mistake of only being open during local working hours. Two examples are highlighted in Brian Reade’s excellent book “An Epic Swindle” which demonstrate how ‘amateur’ the club was in its approach to marketing. So after buying the last few remaining Dudek mugs and wandering around the outside of the ground, they travelled back to Old Trafford to spend their money. So much for getting a glimpse of the Champions League Trophy or The Kop. So much for Anfield being a warm and special place. Throughout the 90s “Old Trafford was Harrods while Anfield was a corner shop”. It was as if he was writing about Liverpool before Shankly. But you see, in the 80s that’s how football clubs existed. Liverpool were far superior on the pitch and so it didn’t matter if they weren’t commercially savvy, they could attract players, supporters, and trophies. Other clubs had tried to take their crown but were unable to maintain any sort of challenge. Nottingham Forest, Leeds United, Aston Villa, Everton, QPR, and Manchester United had all challenged Liverpool’s place at the top to varying degrees of success. None had managed to maintain any consistency and certainly struggled to build more than one good side. But football now had money. Money gave many clubs a better chance of attracting top players as they would sign for a club even if they had not heard of them before or their trophy cabinets were bare. Now, I am not for one minute suggesting Manchester United are resembling anything like Liverpool’s commercial acumen of the 90s and early 21st century, but if you compare how Manchester City and Liverpool are now able to compete on this front then it must bring concerns. Add to the fact they are currently ahead on the pitch, then United really should have a re-think. “Ha! We paid all this money for you and here you are asking us what you should do?”, scoffed Fagan loud enough for everyone to hear. By the time Souness was in charge of the club things had changed. Here is where you can draw a similarity with Jose Mourinho at United. His particular brand of management worked at Chelsea, Inter, and Madrid: but only for a while until people got fed up with him. But this time around you could argue whether he ever really had the players on his side. During Ferguson’s reign at Old Trafford, the most they spent in one season on transfers was £63m in his final year. In 2007-08 they spent almost £62m. In the first season after he retired they spent almost £68m. In Louis van Gaal’s first season they spent £145m and then a further £100m the year after. In the first four years post-Ferguson they spent £465m. If you go back over the final 10 years of Ferguson’s time you find he only spent £380m. In fact, it took Ferguson 12 years to spend what United have spent in four years since he left. Yet has success been matched? United would be able to get away with some big signings every few seasons, Ferdinand, Rooney, van Nistelrooy, Veron etc. Yet now they are competing with Manchester City, Liverpool, Chelsea, Tottenham, and Arsenal. All willing to splash the cash. So how is it David Moyes failed so badly with a side who were league champions? My take on the matter was to liken it to the Le Mans 24-hour race. This is where you have more than one driver and they take it in turns to spend time at the wheel. So Fergie is driving the car and he’s hammering it around the track. He’s going on far longer than expected but he’s in front. However, the stress he’s put on the car is such that the tyres are worn and the gearbox is struggling. The team is still winning as Fergie is a good enough driver to overcome the issues. To the naked eye, all seems well but it’s not until you get in the car you realise there are problems. So Fergie eventually hands over to Moyes. He is a more cautious and less experienced driver. He notices the tyres and the gearbox. Fergie has basically hammered the car into the ground. Moyes wants to make changes yet the performance drops as a result. Was Ferguson’s management of the team in his final season more reckless as he knew he wasn’t going to have to deal with the consequences a year later? Even subconsciously? This piece isn’t to rubbish Ferguson, it is to consider the similarities between what happened to two great clubs and how long it can take to put right. Things didn’t start to improve for Liverpool until Gerard Houllier came onto the scene in 1998. This coincided with the emergence of Michael Owen and Steven Gerrard. Houllier immediately set about improving the training facilities. Bringing them into the 21st century. Three trophies in one season and five in one calendar year in 2001 illustrated progress. But it wasn’t until Rafa Benitez took over before they became serious title contenders. By then, David Moores had made the fateful decision to shake hands with George Gillet and Tom Hicks. This set the club back years. Liverpool were so desperate for success they were seduced by the flannel of two Americans, or Cowboys as Brian Reade named them. The changes at United can be linked back to not only the stepping down of Alex Ferguson but also David Gill, the Commercial Director. Both left the club in 2013. Gill was replaced by Edward Woodward. His appointment and the death of Malcolm Glazer in May 2014 I believe have had a real effect on the way the club is run. Woodward was the executive vice-chairman, a ‘money man’ and promoted to the top job at the club. Malcolm Glazer was head of the Glazer Family and widely regarded as cautious, where finances were considered. Since 2014, United can be anything but cautious. Transfer deals such as Pogba (£89m), Lukaku (£75m), Di Maria (£60m), have certainly sent a message they’re prepared to spend big. Added to that the Falcao and Ibrahimovic deals, which albeit didn’t cost anything up front, certainly represented a huge commitment in terms of wages. Some have commented on how the club can easily afford the wage costs. Shirt sales in Asia alone probably paid for Ibra’s time at Old Trafford. But his time there resulted in the notoriety of his only spell with a club which didn’t produce a league title. It has been argued where United were successful on the pitch was when Ferguson was in charge of the team and Gill was in charge of the club. With Woodward replacing Gill and Moyes/Van Gaal/Mourinho all having a go at the Ferguson impressions, the club has lost their way. The balance sheet may look healthy (as long as you ignore the debt), but there are certainly concerns on the pitch. One pundit at the weekend suggested they needed to move the money men aside and replace them with people who understood the club. This week’s managerial merry-go-round would suggest they are not ready to make that change. Initially, they gave Mourinho a three-year contract. In the summer, with one year still remaining, they extended it. Gary Neville argued this is where the board relinquished the initiative. They should’ve kept him keen by refusing to negotiate until the end of this season. It certainly would’ve saved them money, but Neville also believed Mourinho was then able to put in his demand for new players and then complain the board hadn’t backed him when they were not forthcoming. Right from pre-season Mourinho argued he needed better centre-backs, yet the club refused the sign any. How that made the players Mourinho then picked in those positions feel is unclear but they can’t have had much confidence. My point is that I believe there are valid comparisons between what happened to Liverpool after 1990 and what has been happening to United since 2013. Clearly, there are differences. With Liverpool, much of the issue was commercial and their failure to see where they needed to improve. With United the commercial side is very successful but they need to find a way to marry this up with performances on the pitch. They were the second best side in the league back in May, so you have every right to ask why is there a problem now. But everyone could see all was not well in the camp. Was it simply Mourinho? Time will tell. Have they solved the issue by removing him and putting Solskjaer in temporary charge? Solskjaer seems to have been given the job of getting the fans back onside. A return to the days of attacking flair down the flanks could be on the cards. But what will, or can, he do about the defence? Is his strategy similar to that of Kevin Keegan at Newcastle? Are United fans happy to accept this season is over and they will look to attract a top name for next season? Do they give Solskjaer money in January? If they do will that be awkward if he buys players the new boss doesn’t want? Relieved of Mourinho’s shackles the players may well respond to Solskjaer’s freedom. Again, time will tell. It’s five years since their last league title. If this season has been written off then that’s six. If a new man cannot make the necessary improvements quick enough then before you know it, it could be 10, 15…? 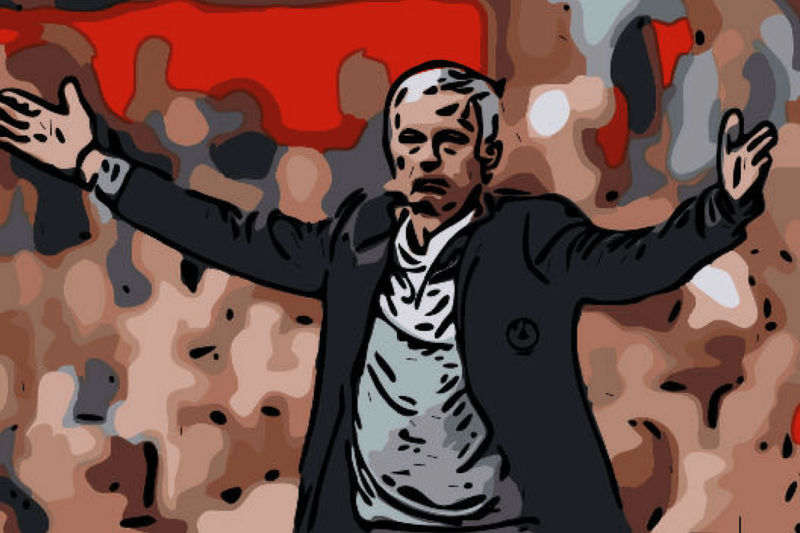 This piece is not to crow about the situation it is simply to point out United’s problems may well be more than just Mourinho and they may have yet to discover where their issues really lie.